Easter Bunny Full Costume. One size fits most adults and teens. All in ex condition. Taken out of box for inspection. Costume was never worn. All shipping free within US. All international shipping is done through the Ebay Global shipping Program and is not free. All items graded on how they look day of posting and will be packed and shipped in same condition. All acution style listings must be paid within 3 days of winning. DANDEE BIG HEAD. Clean inside & out. SIZE: One Size Fits All. 14h x 16w plus 8" ears. Shoe covers have elastic at ankles & under foot (NOT INCLUDED). 100% polyester fabric; 70% acrylic/30% polyester faux fur. length 60". Mitts have elastic cuffs (NOT INCLUDED). White faux fur mitts. White faux fur covered latex mask. Rubber fur covered feet. Vision for the mask is through slits above the eyes. Suit length from shoulder to bottom hem-56". Retirement sale. Liquidation of our rental mascot costume inventory. Costumes are all preowned, normal wear is common on foot covers. We keep them as clean as we can, anything non-typical will be noted and shown in pics. Happy Easter Bunny - faux fur covered soft foam head, matching full body jumpsuit (Zippered back....once fully zipped, we recommend to put a safety pin across the top to keep it secure and on its track during movement), new white gloves, and new foot covers. Easter Bunny Costume Classic. Condition is Pre-owned. Shipped with USPS Priority Mail. 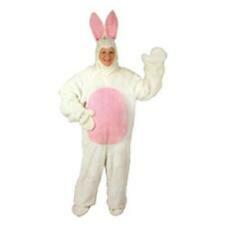 This costume has been a solid money maker throughout the years to ply Easter Bunny for children at parties and such. It’s got hands and feet and is made of faux fur. Purchased I. 1992 it is in excellent condition. Adult up to 46" Chest. Shoe Covers. One of the eyes has the screen missing but this could be replaced. See photos. Over-sized head has inner adjustable strap for fit & comfort. Feet have foam padding, vinyl soles. Fur gloves have white backs, pink palms. Perfect addition to your Easter festivities! Mitts will either be all white or white & pink. Suits and mitts are machine washable, dryer dry. Head & feet can be spot cleaned. Hop 'till you drop in as this fun and friendly bunny! Includes a full fur-covered vinyl headpiece as well as an extra open-face hood with ears for versatility. Does Not Include basket. A perfect outfit for your next Easter Egg Hunt. Adult Standard Size. Fits Up to a chest size 42. Fun World Div. Easter Half Mask with Pink Bunny Ears & Nose. Used. This item is being sold “As Is” “As Found” with “No Returns”. If you have any questions regarding this listing, don’t hesitate to send me a message. Easter Bunny Suit Costume 5T from old navy, super cute and in good condition, there are some light stains on the hands-see pics-but nowhere else -I take great pride in selling my sons gently used baby gap clothing. Any flaws or imperfections not listed unnoticed mistakenly, no returns, see my other Gap kids items for sale. Party City-Easter Bunny Full sold out in stores Costume Brand new, Never Opened. Condition is New with tags Shipped with USPS Priority Mail. Includes mitten gloves with elastic at wrists, and shoe spats with a velcro closure. Fits most adults up to size 56". Easter Bunny. Complete Outfit. Adult OSFM. See Size Chart Image For Sizing Information If Available. Due to differences in computer monitors, and the way each display colors we will not be responsible for variations in color between the actual product and your screen. Size: Fits adult large up to 200 lbs and 5'11". You can use the included ears on a headband or choose to use the full plush hood with ears! Bunny Nose. Different manufactures have their own sizing system; the charts below represent a‘basic guideline’. One size fits most adults up to 6 ft. 200lbs. Acrylic and polyester. 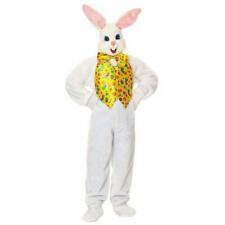 S HI PP IN G.
Get a head start on your Easter egg hunt this year with this Deluxe Easter Bunny Suit. 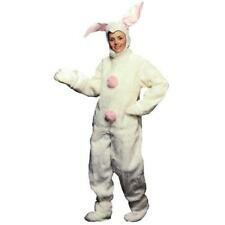 Get into the Easter spirit with the Deluxe Easter Bunny Suit. gender: Male. luxurious Edie Gray Bohemian Area Rug - 7'10" x 10'3" USD 180.00. Just be careful of the kids who like to pull ears and tails! Do not attempt to drive while wearing the head; it does obstruct vision. (So it'd probably be a good idea to really watch your step as you go down or up stairs as well!). The body of this outfit is machine washable. The head can be Dry cleaned. It can fit 5'2"(160cm) to 6' feet (180cm)Weighing up to 180lbs. The body of this outfit is machine washable. Water washing or dry cleaning. Inside of head made with durable, breathable and lightweight EPE foam, to give an enjoyable wearing experience. Communication is important. Designed with computer modeling software to give it the impressive look and shape. The body of this outfit is machine washable. The head can be Dry cleaned. It can fit 5'2"(160cm) to 6' 1" feet (185cm).